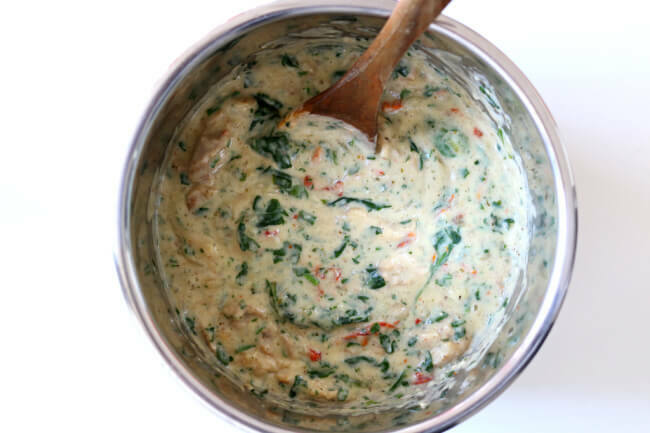 Instant Pot Creamy Tuscan Chicken–creamy chicken and sauce with sun-dried tomatoes, spinach, Parmesan cheese and garlic. 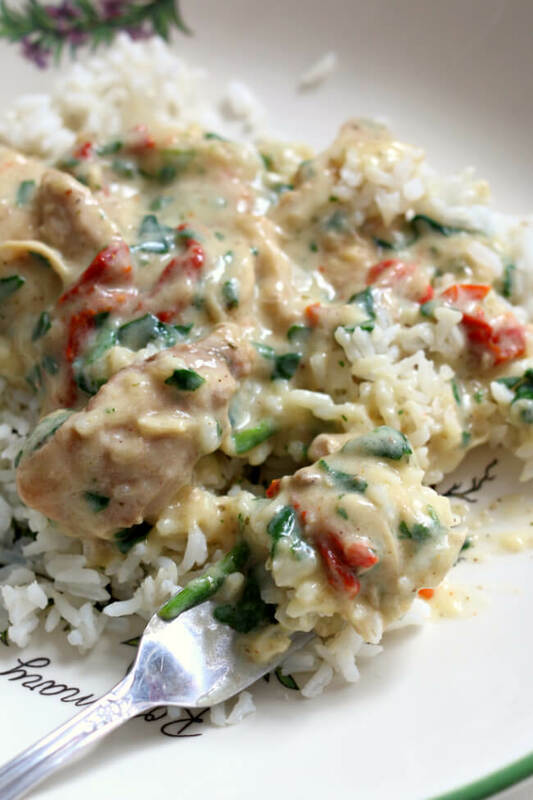 Make it fast in your Instant Pot! 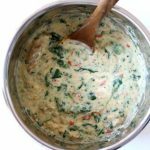 Spinach: Fresh or frozen spinach will work for this recipe. Spinach gives the recipe a pop of color. Just stir in the amount that you want. I like a lot of spinach but you can also just throw in a couple handfuls. If using frozen spinach turn the saute setting on to heat the spinach through or you may just want to thaw the spinach first. 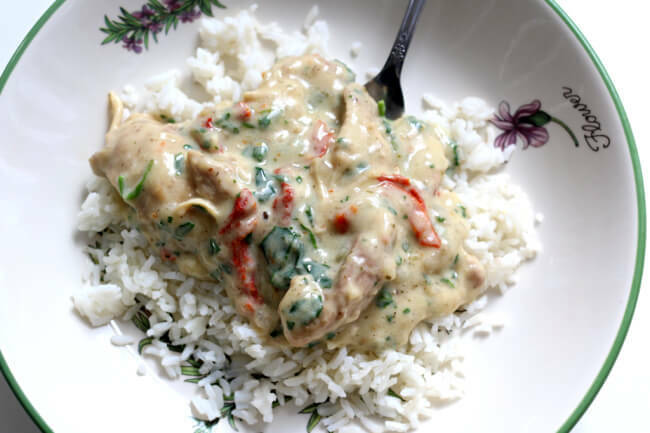 To make Instant Pot Creamy Tuscan Chicken I used my 6 quart Instant Pot Duo 60 7 in 1*. I love this Instant Pot because it has the yogurt making function which I use almost weekly. It has two pressure settings (high and low), and there are also little slots in the handles so that you can rest the lid there instead of putting it down on your counter-top. Saute: Turn your Instant Pot to the saute setting. When the display says HOT add in the oil and swirl around. Add in the onion and saute for 4-5 minutes. Add in the garlic and saute for 20-30 seconds. Deglaze the pot with the chicken broth. Add ingredients: Nestle the chicken into the pot and sprinkle with Italian seasoning. Pressure cook: Cover the pot and secure the lid. Make sure the valve is set to sealing. Set the manual/pressure cook button to 12 minutes for chicken breasts or 15 minutes for chicken thighs (add 2 minutes if they are frozen). When the time is up let the pressure release naturally for 5 minutes and then move the valve to venting. Remove the lid. Make the sauce: Use tongs to place chicken on a cutting board. Turn the Instant Pot to the saute setting. Stir the cream cheese into the liquid in the pot. In a small bowl, stir the cornstarch and warm half and half together until smooth. Then pour the mixture into the pot. 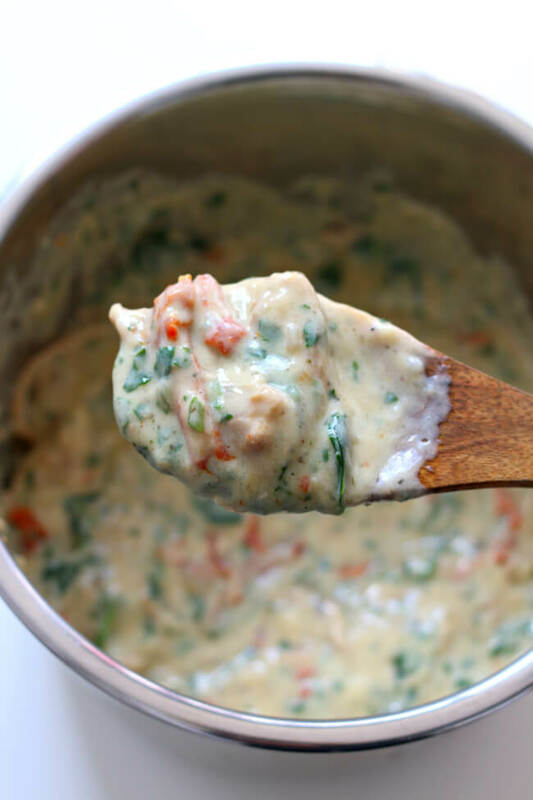 Stir until the cream cheese is melted and the sauce is thickened from the cornstarch. Stir in the parmesan cheese. Final touches: Shred or cut the chicken and then stir it back into the pot. Stir the sun-dried tomatoes and the spinach into the pot. Salt and pepper to taste. Pot in pot rice can be made at the same time as the chicken. I made this last night for supper it was delicious. Cleaned his plate and smiled big. I totally forgot to take a picture but it was beautiful just like the picture. I used thighs and they were so tender shredded so easy. This is definitely one I will make again. Thank you for posting it. Oh this warms my heart. I love the “new vegetable” story!!! Why not just use a rasp for the garlic . Much quicker and easier to clean. Good to know! Thanks for the idea. I really am not familiar with those products so I’m not sure how they would work out. Looks yummy! My family is not keen on spinach. I wonder if you could do broccoli instead? I’m thinking add it to the pot before cooking. What do you think? Why not use broccoli? I would add red and green bell pepper also! Any vegetable would be great for this. Just be careful not to add soft vegetables (IE: zucchini, peppers etc) until near the end of cooking! You don’t want them to fall apart. Do you care for mushrooms? Let us know how it comes out? Broccoli would be great! But I wouldn’t throw it in there. It will be disintegrated. I would add it in afterwards. Maybe steam it in the microwave first.